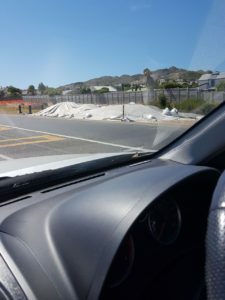 If you are busy with a construction project remember to Cover Sand and other building materials to prevent them from blowing away and causing elevated fallout dust and nuisance dust levels. Not only does it cause dust but it also costs you money – your raw materials are literally being lost in the wind! “Gritty construction dust is the bane of any remodeling project or large home repair job, whether you’re hiring a contractor or doing the work yourself. Dust can damage furniture and rugs and ruin the finish on a hardwood floor. Plus, as I’ve seen with nearly every home I’ve remodeled, dust inevitably finds its way far beyond the work area, traveling on shoes, clothing, the slightest breeze and even through ductwork. Although the dirtiest work takes place during demolition and drywall sanding, every phase of construction produces dust. So it’s important to prepare for the onslaught before the job starts and maintain dust containment systems to the very last days of the project. If a contractor is involved, that’s his responsibility, but dust control often slips down the list of priorities, forcing you to play watchdog. If you’re doing the work yourself, preparing dust-containment systems can get forgotten in your eagerness to get right into the “real work.” Don’t let it. Dust containment falls into two general categories: protecting floors and confining dust to the work area. It does take time to set things up properly, but I can assure you that for every dollar or hour spent preparing, you’ll save five dollars and five hours on cleanup or repairs. It costs $2 to $3 per square foot to sand and refinish floors, so protecting them during construction is a wise investment. My crew and I start by thoroughly vacuuming floors to remove existing grit, then we lay down a layer of 6-mil polyethylene plastic, overlapping the edges 6 in. and taping the seams continuously with duct tape. After that, we tape the plastic to the baseboards or walls. Masking tape will do, but painter’s tape, designed to be removed without taking up paint or leaving adhesive residue, is a better choice (you’ll find it where paint is sold). On top of this layer of plastic, we place a single layer of 1/2″ foam-board insulation, which costs around $7 for a 4’X8′ panel. Protective panel materials, like 3/8″ plywood or 1/2″ paper based pressboard (Homosote), also work well. To seal the panels, we cover them with another layer of 6-mil poly, overlapping and taping the seams and edges. We also place crosshatches of masking tape in traffic lanes to reduce slippage. It’s tempting to use just a layer of Kraft paper, but this won’t protect against spills. Plus, the leg of a stepladder can easily tear paper. So, instead, we put down two layers of 6-mil poly, treating the seams and edges as described above. We always cover these with a layer of Kraft paper for added strength, paying careful attention to the seams and edges. We also cut five 4’X4′ poly patches and set them aside. If a ladder or sharp tool punctures the protective layers, these are handy to tape down as patches. For the path to the work area from the garage or door that leads outdoors, we usually lay down runners. Rubber-backed 4 X 20-ft. runners are ideal. Rolls of heavy-duty, adhesive-backed protective plastic also work well (100 sq. ft. costs $20), but since the material can be slippery on stairs we also use the tape crosshatches here. Before the project starts, always designate one doorway as the entry and exit to the work area. To seal up the other doorways, we use 6-mil poly and masking or blue tape. For doorways that open onto other rooms or hallways, we seal both sides. For the designated entry doorway, we use a two-layer plastic system. On each side of the jamb we secure one sheet of plastic that’s 12 in., bigger than the doorway on all four sides. (We use masking or blue tape, or a staple gun if the jamb isn’t finished.) Leaving the sheet on the dusty work side of the door intact as a single sheet, we slit the outside sheet down the center. These plastic skirts will help keep airborne dust from traveling. Another option I’ve seen work well is to install a temporary dust door. These plastic doors (around $20) open and close with zippers. Protective Products is the leading maker of them and other clever dust-control systems (Protective Products details on the right). Whoever is in charge of dust control should pick a window at the far end of the work area and mount a window fan there, blowing out. We seal around the fan and window frame with 6-mil poly, then we tape the plastic to the sides of the fan to create a good seal. Weather permitting, we run the fan all day long. This draws air into the work area and keeps dust from drifting to other areas of the house. If ducts are part of your heating-and-cooling system, make sure it doesn’t run during construction, if possible, or divert air away from the work area. We cover any registers in the work area with kraft paper and tape. (I tell homeowners who have to run the system to replace filters weekly during the project.) We also remove all window air-conditioning units from the work area—they easily get clogged with dust. Once the job is under way, the main source of dust comes from cutting wood. I have my carpenters cut outside whenever possible, but for wood cuts that must be made indoors, I ask that they attach dust-collecting vacuums to their power saws. The same goes for sanders, especially those used by drywall contractors. It’s a good idea to follow this example if you’re doing the work yourself. Whether it’s a big job or a small one, at the end of each day I have my crew sweep up; twice a week we thoroughly vacuum the work area. Before anyone uses a shop vacuum, we clean it out and brush off the filters. I’ve also found that lightly misting the filter with water makes it more effective at trapping fine dust. We always purge the vacuum by running it outside the house for a minute before bringing it inside. A dirty vacuum started “cold” indoors will throw off lots of its own dust. No matter how carefully you and your contractor follow my advice, the job site will get dusty and some dust will find its way outside the work areas. All my remodeling contracts include a fee for a cleaning service. Typically I write in six hours of cleaning to be done at the end of the project. If you want or need more, add that in during the initial contract review or hire a cleaning service on your own. What systems and barriers will be used, when they will be installed and who is responsible for maintaining them. Who is responsible for damage caused by dust, like scratched floor finishes or soiled carpeting. I trust you enjoyed the read!